What do you do when something you love, something you spent time and money on, fails to meet your expectations? Generally, there are two things you can do. Write it off as a bad gamble, or give it one more solid go — everything you’ve got — and see if you can turn things around. Two years ago a friend and I launched Snowflake Tiara, a duo of Christmas stories set in Helena, Montana. We fashioned it after the Love Finds You series, where they offered two short novels, one historical and one contemporary, in their Christmas releases. Alas, the publisher closed their doors about the time we were ready to submit. So we published it ourselves. It did very well initially and got great reviews, but sales quickly tapered off. Was it the mix of historical and contemporary? Was it the cover? Was it the stories themselves? So hard to know. But I loved my story — even though it was out-of-the-box for me, being set in a beauty pageant! — and wanted to give it another shot at life. This summer I wrote the sequel to More Than a Tiara, my half of Snowflake Tiara. Other Than a Halo is currently with my editor — you’ll hear more about it next month when it’s available! I expect to write and release Better Than a Crown, the third and final book in the Christmas in Montana Romance series in the fall of 2017. For now, I’ve done a light edit of Tiara and purchased a new cover, which I love. You’ll notice a very different look from my Farm Fresh Romance books, though it was done by the same designer (my daughter) from her own photo shoot. What do you think of the updated cover? More Than a Tiara is available on Kindle, Nook, Kobo, and iBooks. Click for first chapter, more information, and sales links. 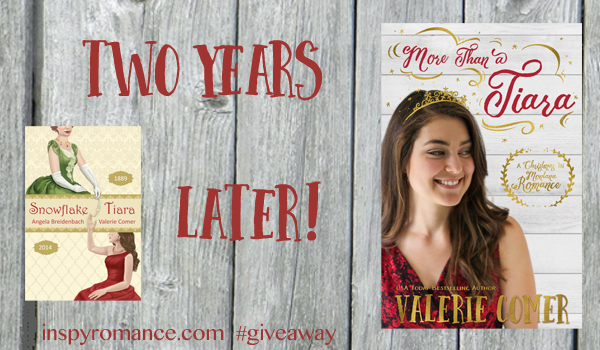 I’m offering two ebook copies of More Than a Tiara to commenters. Winners will be announced in the October 16 Sunday Edition. 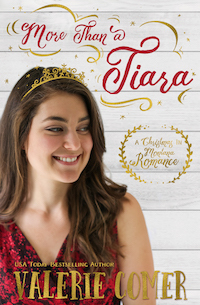 If you’ve read Snowflake Tiara (2014) or the Home for Christmas multi-author box set (2015), you’ve read More Than a Tiara. Here’s the question: Have you ever done something with good intentions, but had it backfire? Or you can simply comment to throw your name in the hat! “Stop and think” isn’t all that common these days! Thanks for sharing. Thank you! I’m expecting Other Than a Halo back from my editor today. Another inspiring romance. The new cover is breath taking. Your designer daughter captures the mood of the story. Best wishes on your new series. Unfortunately good intentions can often backfire because as humans we all see life differently. Oh, thank you, Renate! I can’t wait to see her cover for Other Than a Halo as well. Love the new cover, Val! Good luck with the series. Love the new cover..You have a talented daughter! Thank you… and yes, I do! I’m currently reading More Than a Tiara and enjoying it. Thanks for another great story! I like the cover,too. Yay, Diana! Thank you so much. Other Than a Halo is Bren’s story and will be out early in November. I have done many things with good intentions just to have them backfire. Some days I feel cursed and just want to disappear because nothing I do lately turns out right. Cassandra, my heart goes out to you as I offer a prayer on your behalf. May God shine the light of HIS love and HIS approval, cloaked in Jesus, to you today. Your daughter is very talented and the new cover is great. You asked if I’d ever done anything that had backfired……Well once when I was on a date with my boyfriend, “now husband” we were talking about what it looked like in the olden days, where the man was sooo gentlemanly, I pretended to faint. Unfortunately, I “fainted” and landed in a little “deposit” a dog had left and the owner hadn’t disposed of. Not a fun way to impress my date! True Love is for better or for worse… and while there are definitely things worse than a dip in dog do, that could be a big deterrent to a fledgling relationship! I can’t think of any backfires at the moment. Love the cover. I live in Helena, Montana and am putting this on my wish list. Have a great day! Yay! I hope I’ve done justice to Helena! We had such a lovely time there. It sounds like a good book, and I’m sure the sequel is great, too. A nice cover and the story sound quite interesting. The tiara doesn’t hold names very well. It’s not very bowl shaped. ;) I understand grandgirl brain fog. I have had it recently as well… although I wouldn’t want to say no to having her! Loved the story and I look forward to the next two. Beautiful cover! And the story sounds intriguing! I’m glad you aren’t giving up on this story and I look forward to reading the rest of the series! 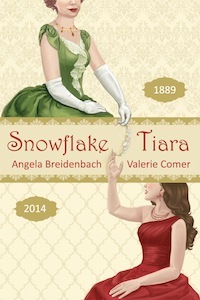 I think the two stories in snowflake tiara complimented one another and flowed well and I love the cover. New cover is great too, well done Hanna! Thanks! Angie and I worked hard on the original pairing. Now it’s time to let them find their own way, although we’re also leaving the duo for sale. So please throw my name in the hat, thank you! Consider your name in the hat, Gail!